We are Atlanta Girls' School. We prepare girls for college and beyond. We help each girl develop a deeper sense of self, a firm command of her own voice, and the understanding that she is able and impelled to influence change in the world. Come join us. AGS offers girls in grades 6 through 12 a college-preparatory curriculum of the highest standards. 100% of our graduates are accepted to a four-year college or university. Our faculty has an average of 10 years of experience, and 61% hold advanced degrees. 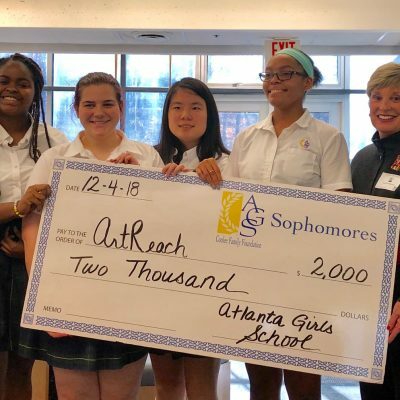 Atlanta Girls’ School students, graduates, and faculty are extraordinary. Meet us. Sally’s passion for service extends beyond her local community. Over the summer in 2016, Sally traveled to Thailand and Cambodia for four weeks. In Thailand, she focused on teaching Thai students English and taking care of elephants in an elephant sanctuary. But her time in Cambodia is where Sally notes she saw her most personal growth and where her passion for international development was confirmed. She began the trip by learning about the history of the Khmer Rouge and the impact it had on the government and the people of Cambodia. She also visited multiple NGOs that work to fight the corruption in the government and provide means of alternative therapy. Sally hopes to continue this service work in international relations and pursue a career in the nonprofit sector. In Fall of 2018, Sally will attend Tufts University. Sally is a member of the Class of 2018. We often tell people that teaching is rewarding, but we do not always see the reward of a day’s work in our profession. We do not see final products like the construction of a church or a successful surgery that has saved a life. As teachers, we might not immediately see the fruits of our labor because the work we do is gradual. We lay the foundation for a child’s growth by touching her heart, expanding her mind, and helping her find her voice. Teaching is a labor of love that requires us to believe that we are making a difference. We have to trust that the knowledge we impart, the skills we teach, and the behaviors we model will make lasting impressions on our students. I trust that I do this. It is why I teach. Olivia is a member of the Class of 2019. Dr. Suzy Beckham joined the AGS community in 2016. A jewel of a teacher, in her math, physics, and chemistry classes, she shares her extraordinary passion for science and her creativity in a way that brings her subjects to life and makes learning really fun. Suzy is a self-professed chemistry nerd with a lifelong interest in math and science. For high school, she attended the North Carolina School of Science and Math, and then at Davidson College, she majored in chemistry. Then she went on to study organic chemistry at Stanford University. Her ability to relate math and science to everyday living is really valuable, especially for girls who shy away from these subjects. She has a unique way of seeing the world that translates to engaging lessons. She recently created eDay at AGS to celebrate the mathematical constant 2.718. Her students enjoyed “e foods,” including eclairs, Eggo waffles, and English muffins. For her physics students, she made motion far more interesting with Fred, The Jumping Spring Toy Lab. Suzy is the first teacher to have three girls at AGS, Molli ‘19, Audrey ‘20, and Lucy ‘21. This gives her the opportunity to expand her thinking around education and to experience AGS as a parent. She has some unique hobbies, too. In addition to putting together puzzles and playing board games, she loves making spreadsheets. They are her version of knitting. Suzy and her husband are planning motorcycle rides to the four corners of Georgia this summer. You can follow their journey on Facebook – GA4Corners. “AGS is a welcoming community and the teachers always meet you halfway if you don’t understand something. They don’t hold you hand the entire time, allowing you to grow. However, they never hesitate to help you through a problem, whether academic or social. “I very much like how everyone at AGS is also friends with one another. 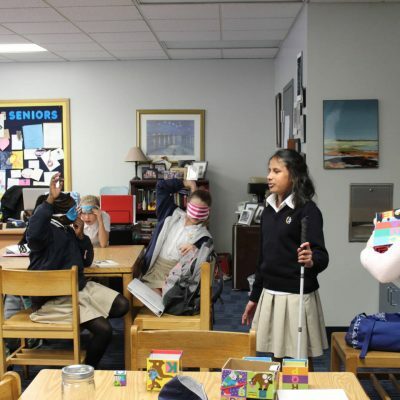 There is no divide between the Middle and Upper School, especially with the Big Sis/Lil Sis and Chick Chat programs. Rachel Platt is currently a junior at Vanderbilt, majoring in Elementary Education and Child Studies with minors in Special Education and Theatre. She works with students speaking Spanish, Arabic, and using American Sign Language and is actively learning each of these languages. Rachel is an active member of the Vanderbilt University Theatre. A founding leader of Category 5, AGS’s a cappella group, Rachel was an avid thespian, musician, and singer involved in many of the school’s productions and talent showcases during her time as an AGS student. An accomplished pianist and singer/songwriter, she also plays guitar. Rachel’s voice and songwriting style are a blend of soulful pop and jazz. She has been captivating audiences as a solo artist since she was 8 and debuted her first original EP, Melancholy, at the age of 15. Her second EP, Fresh as a Daisy, was released in October 2013. In the summer of 2018, she choreographed Onstage Atlanta’s Young Performers’ adaptation of School House Rock Live (Jr.). To find out more, visit the news and calendar pages. 2019 SMART Girls Camp Registration Now Open! Join us this summer for SMART Girls Camp! 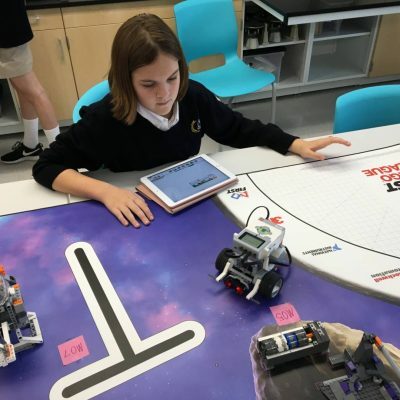 In addition to popular classes in science, math, art, theater, coding, and creative writing, there are expanded interdisciplinary options in the areas of technology, engineering, academic prep, athletics, wellness, leadership, entrepreneurship, and philanthropy. Camp will consist of 4 classes throughout each day. Students can choose which classes they would like when registering. of AGS graduates travel abroad through the AGS Global Travel Program. of AGS students participate in competitive sports. of all AGS faculty have advanced degrees.